Losers. Street Art by Achilles. 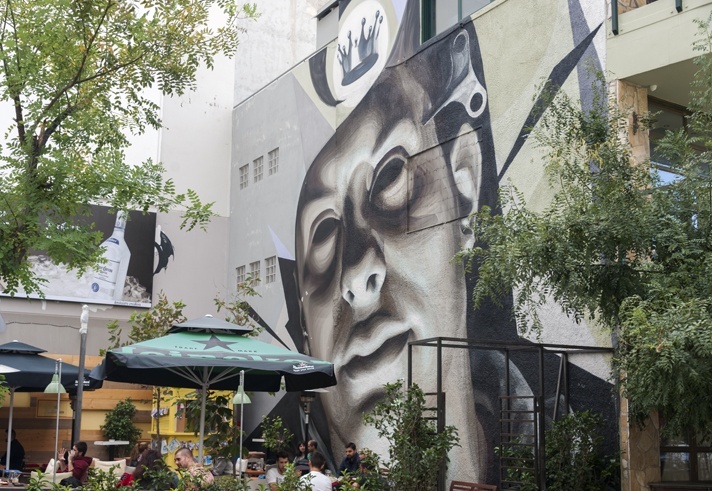 In recent years, the street art scene in Athens has grown so much, it now rivals Berlin and Rome as the European street art capital. 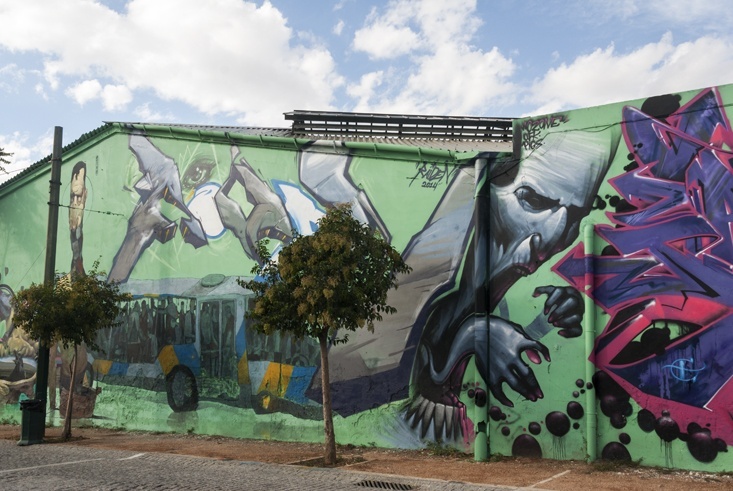 But do you know the stories behind Athens street art? Who the artists are, and what their art is about? 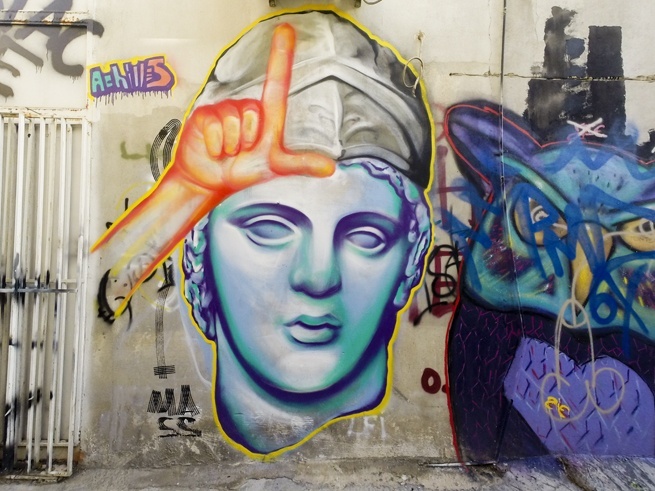 Google ‘athens street art’ and dozens of posts and articles come out. Normally, they’re nothing more than a series of pics with some reflections about Athens, Greece and the crisis. Nothing wrong with that, but we wanted to go a step forward, to learn the stories behind the pieces. For me, street art is indeed art. 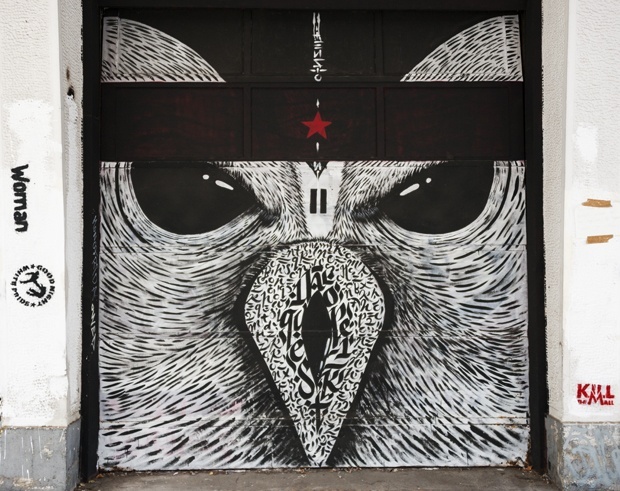 I look at a ROA piece the same way I look at Van Gogh. Street artists are as gifted as Jeff Koons or Damien Hirst, and should earn the same recognition. Or more, considering that street art is there for everyone to be seen, not locked in bank vaults or private collections. 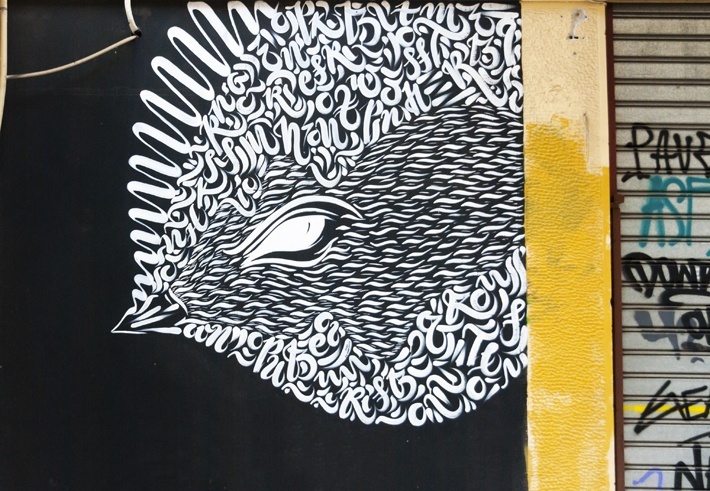 We spent an afternoon walking around Psirri, looking at some of the best street art in town. The pieces were beautiful, but we wanted to know more. Who was the guy that painted melancholic-looking princesses, always with their eyes closed? Who was the giant dog, covering the side of a building? We even saw a street artist, Raiden, putting the finishing touches to a piece. We wanted to learn more. 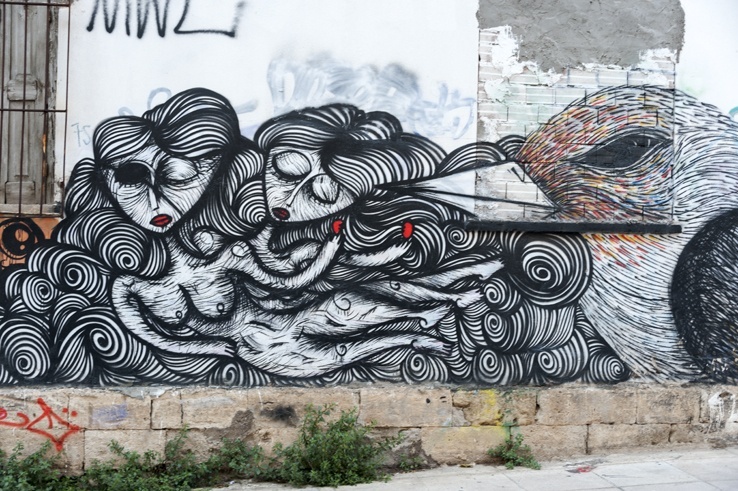 Street art in Psirri – who are the sad princesses? In the same way you wouldn’t visit the National Gallery without reading about the artists and their paintings, looking at street art pieces without knowing them who painted them and why, is nothing more than a half-hearted attempt. 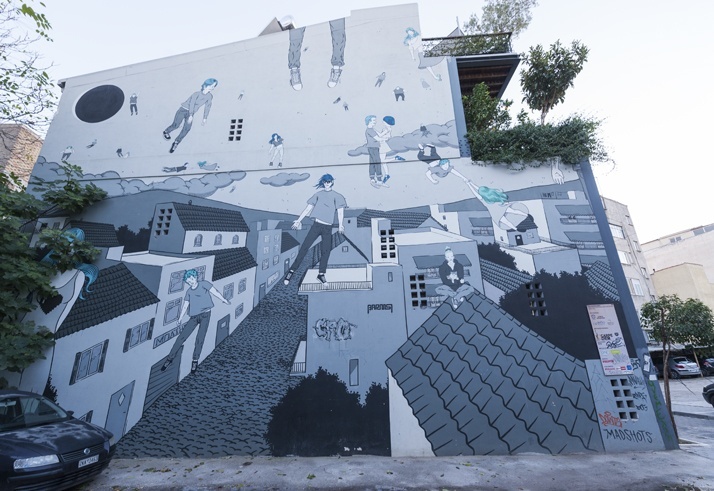 So, when we got the chance to join Alternative Athens Street Art Tour, we jumped at the chance. We met our guide Achilles near the neighbourhood of Gazi, an up and coming district around the former gas station, now a hipster hotspot and nightlife centre. 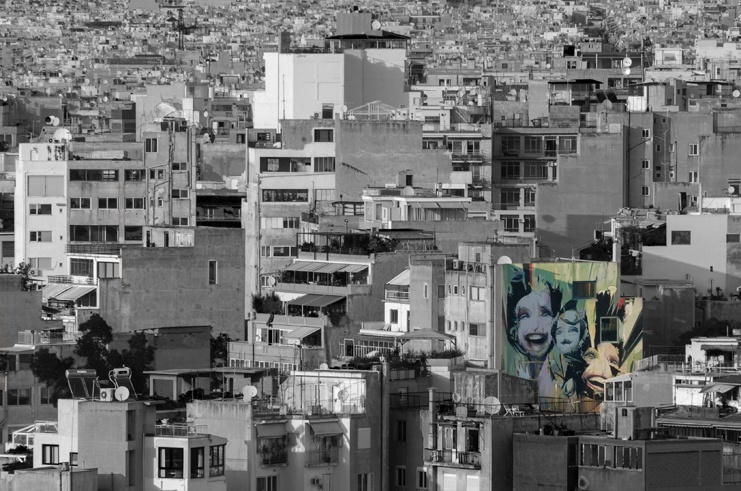 Achilles is a street artist himself, and many of the authors of Athens street art pieces are his good friends. The first piece we saw looked like an abstract bus-monster. As we looked at it, we noticed the artist’s signature. Raiden. The same guy we had met in Psirri, a few days before. Raiden is a tattooist as well as a street artist, and his style is kind of urban and monster-ish. 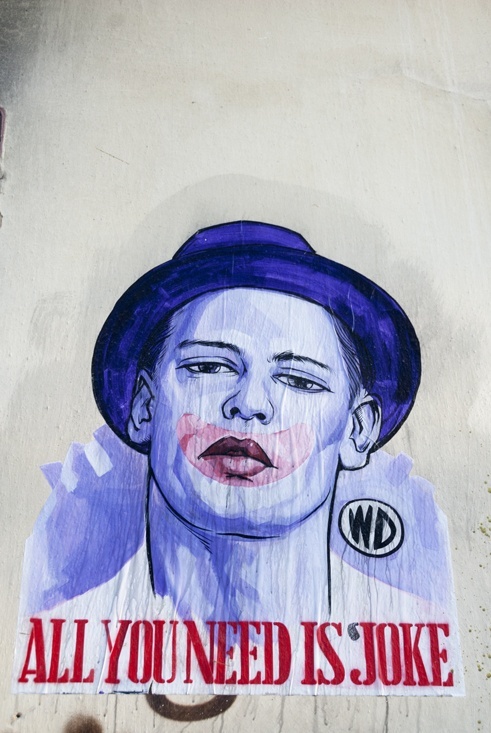 His pieces are bold, with strong colours and writing reminiscent of the street art style of the Nineties. The monster bus was a reference to the building itself, a bus station. Further down, we saw one of the pieces we both really wanted to see, a collaboration between famous street artists Aiva and iNO. The title of the piece is ‘Access Control’. The eye, painted by iNO in his signature soft-strokes style, represent the people. The techno monster, Aiva’s doing, is the government, trying to access the information in people’s minds. The security camera on the left hand side of the piece looks the other way. 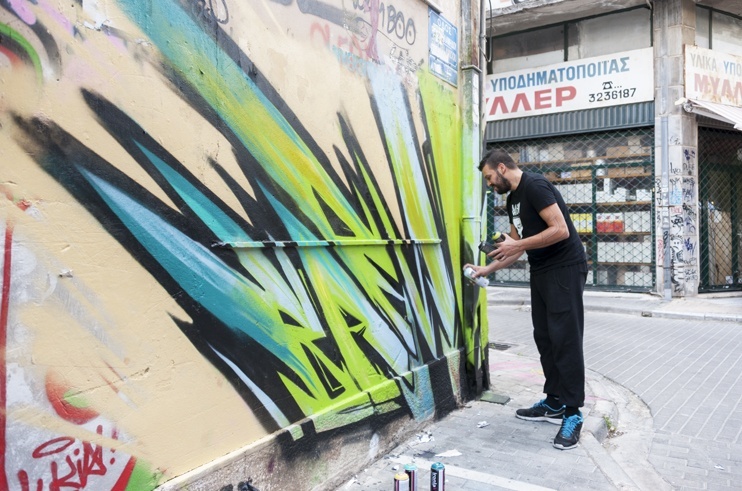 As we head towards Metaxourgeio, one of the hearts of Athens’s dissident underbelly and street art hotspot, Achilles tells us of the money side of street art. 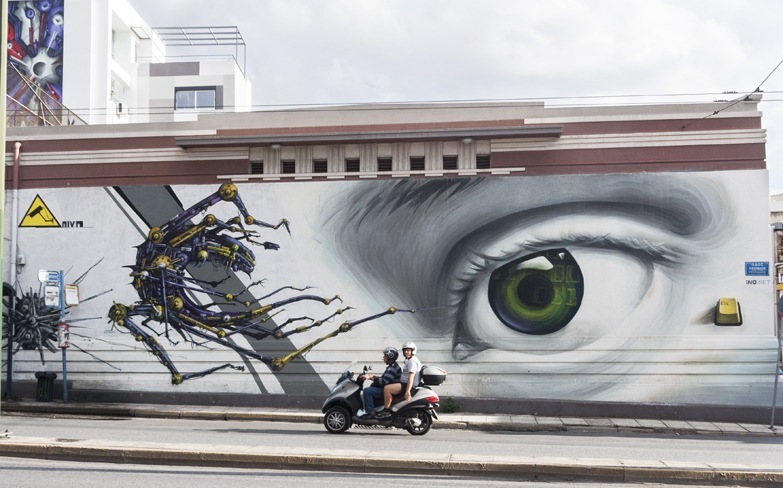 In Greece, street art is slowly gaining recognition, and many artists that started out as teenagers tagging walls are now being commissioned to paint big pieces. However, most still pay for their own paints, between 500 and 1000 euro. Even when a piece is commissioned, it is hard for an up and coming artist to make a profit. Clients are happy to pay for paints, but they hardly ever include a fee for the artist’s work. Achilles then showed a huge iNO piece on the side of a building, showing a man’s face with a key hanging out the side. The title of the artwork is ‘Clockwork’, referring to manipulation of thought. Despite being a famous artist, iNO had paid for the piece himself, a cost that exceeded 1500 euro. Metaxourgeio was called by Achilles ‘the most writer-friendly neighbourhood in Athens’. It’s one of few places where pre-war architecture still stands; beautiful brickwork, houses with gabled windows and iron wrought balconies. 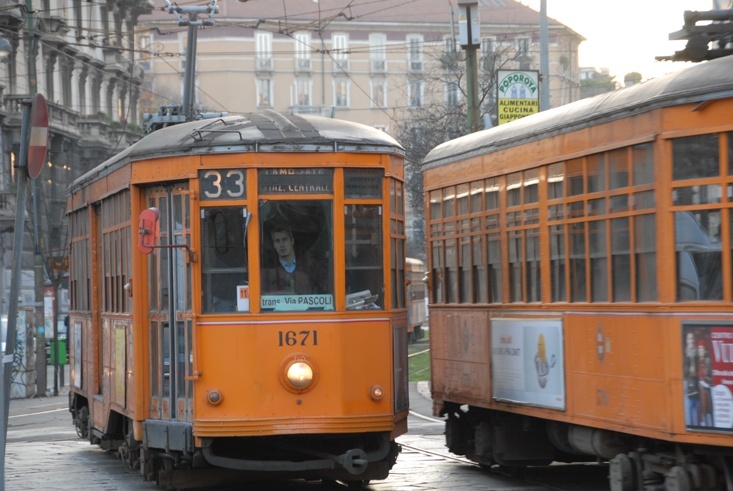 However, it has a rundown feel, perhaps due to the fact that it has been inhabited by immigrants for decades, and hence ignored by city authorities. 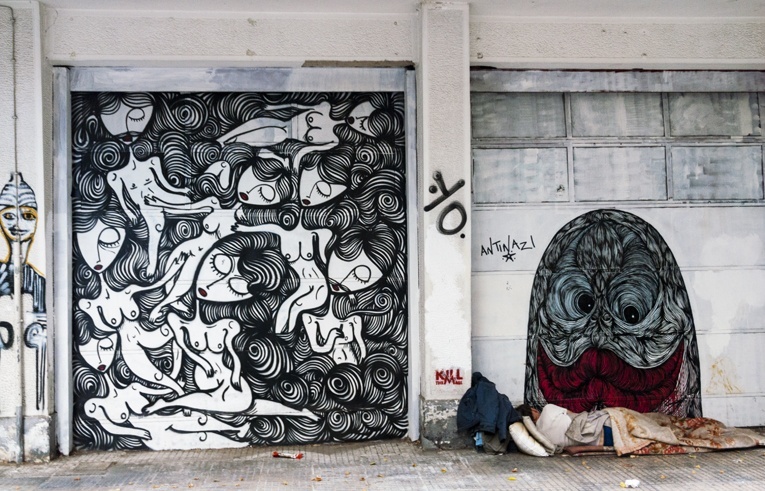 Every year, the people of Metaxourgeio organise a Colour Festival, where writers and street artists are free to visit and paint on the sides of abandoned buildings. 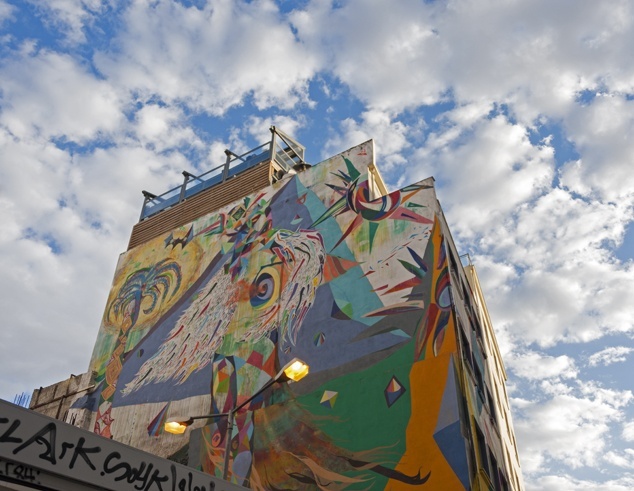 As a result, the district is a real open-air museum of street art. A hidden artwork by iNo, in an abandoned courtyard. Pic taken through a gap in the door. Achilles was well known by the people of Metaxourgeio. Everywhere we walked, people waved and called out for him. There were several groups of children wandering around, and some of them followed us around for a while. The district resident were from all over the world; from the Balkans to the Maghreb, from the Middle East to Subsaharan Africa and China. Some called it dangerous, but to us it looked like a village within a city, a community of people that stuck together. Children played in the street, a boy danced with his own shadow. A scene you don’t often see in the middle of a city. Achilles showed us a couple of his own pieces. He’s fascinated by skulls, and most of his pieces include some sort of reference to the face or the skull. When we asked him why, he said he wanted to look beyond, to explore what is under the skin before painting a face. Good art is always copied! We walked past a large piece, with portraits lined up. The photograph of an old woman was in the centre. It was a collaborative piece by several street artists. The woman in the centre was a local resident, her face could have been Italian, Greek, Syrian or from the Balkans. She was a sort of genius loci, a symbol of the neighbourhood and its people. Each artist interpreted the image according to their style; Achilles used his signature skull imagery. Then, the mystery of the sad princesses was finally uncovered. The artist’s name is Sonke. The first sad princesses were a tribute to his ex girlfriend. After she broke up with him, he started painting them where she walked past on her way to and from work, including messages like ‘let’s be friends’. The princesses became his iconic image, and now most Sonke pieces feature them in various poses. Always with eyes closed. The reason why was a mystery, until Sonke revealed it during an interview. Apparently, he can’t paint eyes very well, and every time he tries, the princess looks cross-eyed. Go figure. As with all museums, every corner of Metaxourgeio revealed a surprise. Achilles told us about STMTS, an artist doing paste-ups (drawings or paintings on paper which is the stuck to a building). He sketches them on a notepad first – this is why he keeps the lined-paper effect on the finished work. 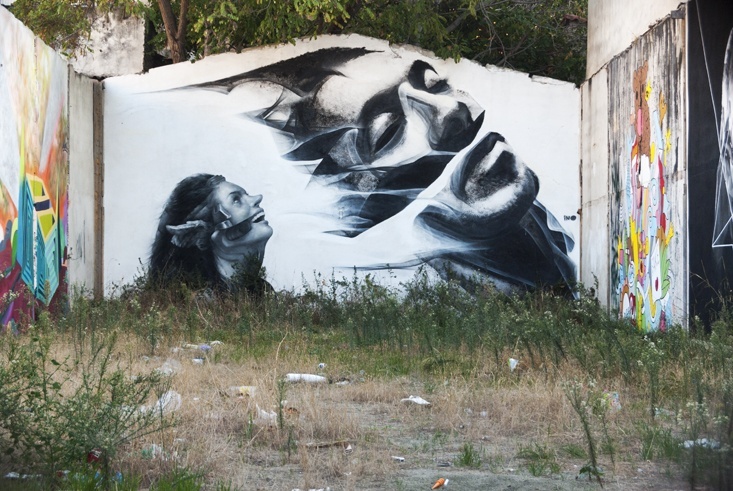 STMTS (real name Stamatis) is only about 20 years old now, and started doing his pieces when he was still at high school. There were many other amazing pieces, like Blaqk’s mix of urban calligraphy and geometric patterns, and WD’s pieces with references to the economic crisis. WD originally hailed from Bali, but he’s been a resident of Greece for many years. We saw several of his pieces during the tour, and were able to appreciate the development of his style. Slowly, we headed out of Metaxourgeio and into Psirri. The street art there looked more institutional and less creative. However, there were still some amazing pieces, like ‘All Dogs go to Heaven’, dedicated to Loukanikos, the most famous of Athens’s protest dogs. ‘Protest dogs’ were strays that were often photographed with protesters during the anti-austerity clashes of recent years. Loukanikos became so famous, he even ended up on the cover of Time Magazine. He died a few weeks before our visit; some say of old age, others say because of all the chemicals he breathed during the protests. 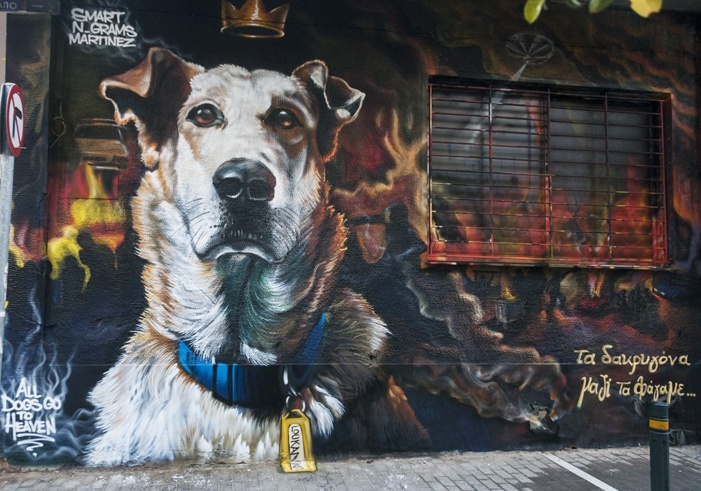 In any case, All Dogs go to Heaven is a beautiful tribute to dogs, in a city that has decided to take stray dogs under its own care. The tour drew to a close back at Monastiraki. Before parting with us, Achilles showed us some big art pieces, commissioned by the Athens Municipality. These are huge, sprawling affairs, visible even from the top of the Acropolis. 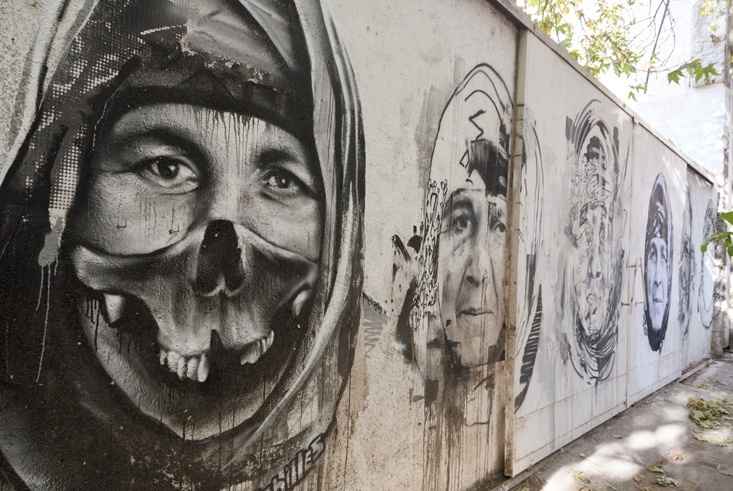 Many disagree over whether street artists should accept these commissions or not, furthering the myth of the artist working in the shadows and escaping the police. Fact is, some street artists still do that. They are rarely arrested these days, but all throughout the Nineties, several street artists have died. A fourteen year old boy I knew was killed in my hometown, after falling on electrified train rails while being chased by the police. Thanks to Achilles, I discovered what Raiden was doing when I saw him paint a few days previously. He was fixing the faded colours of a piece by one of Athens’s earliest street artists, Barns, killed a few years ago while painting a train. He may be gone, but his heritage and his art live on. We would like to thank Achilles and Alternative Athens for having invited us to join the tour. As always, all opinions are our own. Thanks for your comment Eniko. 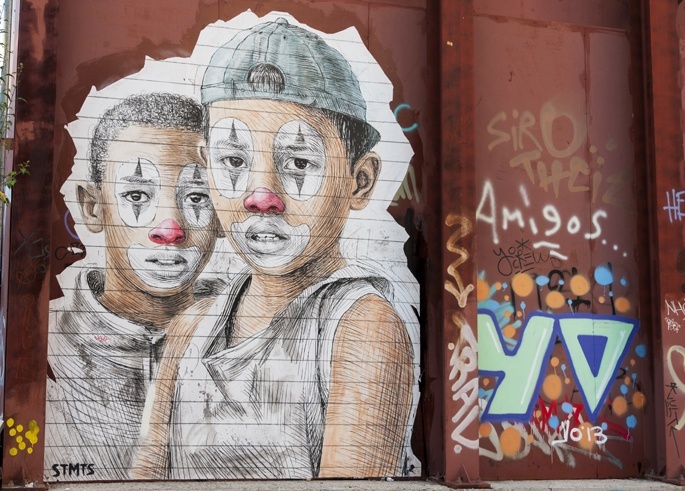 It’s true, street art is so much more than meets the eye, and deserves recognition! Street art is something new for me, which i didn’t know that there is Athens street art out there. I don’t mind spending my whole day capture photos for those cool street art if i got the chance to travel there someday. It’s amazing how the artist spend their time on doing those street art to show it to the world for free or else you need to visit some art gallery just to see their painting. I found it something cool on how their express their thoughts the story behind on how the artist can reach out to the world through their painting with their own stories behind. Awesome! And a post coming soon on our site. Thanks for the post, we can’t wait to see Athens now! I love Penang and I can’t wait to be back next year to explore the street art! Please do send me a link of your Penang street art post, I’d love to read it! WHAT? You’ve never been to Athens? You guys have to go, you’d love the city. The street art is the best I’ve ever seen (but true, I haven’t been to Berlin for ages) and there’s so much to see and do. You’re right about the background stories, they really bring the pieces to life. Thanks for your comment! What a lovely, fun post to read! Also so informative. Before reading this, I’d only seen the art (or photos of the art) but never heard what goes on “behind the scenes” so to say. Thanks very much for sharing this with us! Thank you for stopping by Dana! 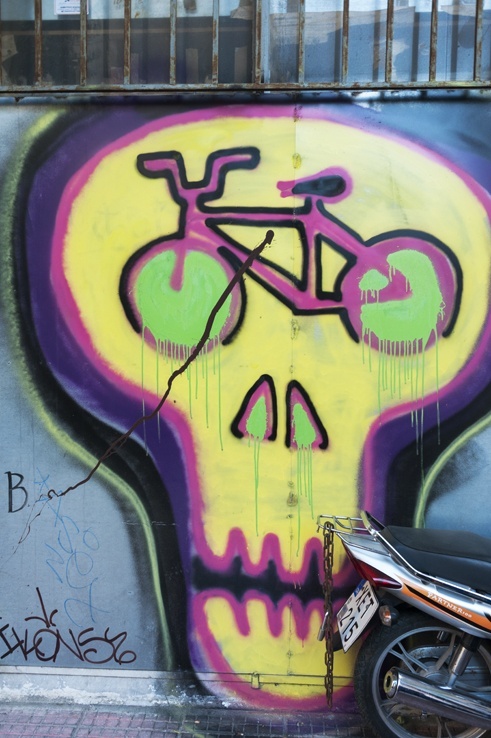 There’s so much more to street art than meets the eye, this is why this tour was so awesome! 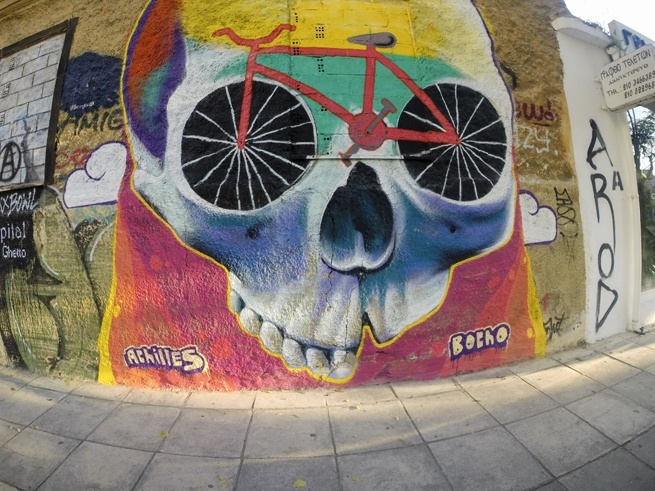 I’ve seen so many photos and posts about Athens street art since TBEX and never really knew it was so popular there. Looks like an interesting street walk! Great photos!